Do you own a tart pan? I recently went from owning zero tart pans, to owning 5. Way to ease into it, right? I bought 4 mini tart pans and a large 10 inch pan. I couldn't decide if I wanted to make mini's or a full tart, so I went with both options. Last week I used the 10 inch pan to make my very first tart. It was a moderate success. The filling was a delicious almond cream. But the tart dough was a little tough. It did not live up to the description of being like a tender a shortbread. I pressed the dough into the tart pan. I am pretty sure I manhandled it a little too much. So I thought I needed to give the tart another go this week. I used my mini tart pans and a little more love and care with the dough. I flipped through, Baking: From My Home To Yours by Dorie Greenspan and found there were many tarts to choose from. At this point it came down to what ingredients were in the house. Lemons? Check. Eggs? Check. Butter? Check. Sugar? Check. 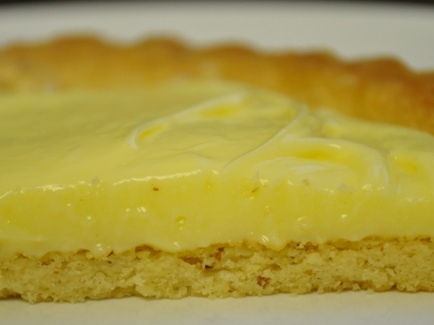 "The Most Extraordinary French Lemon Cream Tart" it is! 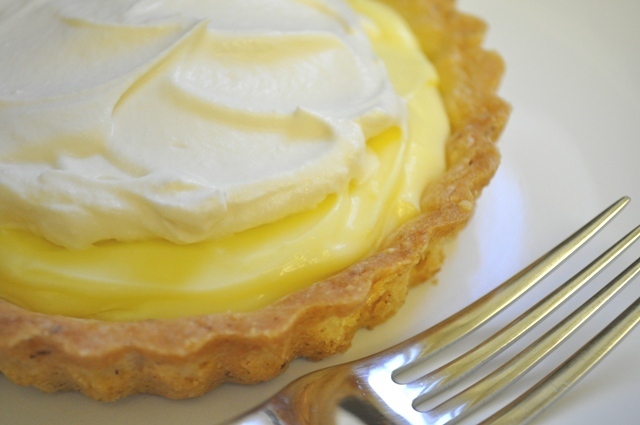 The lemon cream is a mixture of sugar, eggs, lemon juice and lemon zest cooked in a bowl over a saucepan with a few inches of simmering water in the bottom. Just whisk, whisk, whisk until the mixture reaches 180 degrees. The problem is the 2 thermometers I was using wouldn't go above 140 no matter how long I waited and whisked and no matter how much I turned the heat up. Dorie says that it could take up to 10 minutes to bring the mixture up to temperature. After 20 minutes, I finally resolved to the fact it wasn't going to get to 180. But the good news was it did thicken and take on the characteristics that were described in the recipe. The creamy filling gets pushed through a fine mesh sieve or strainer to discard the zest. After it has cooled a bit the lemon cream goes into a food processor to slowly get emulsified with room temperature butter, making it even creamier. A brief 4 hour rest in the fridge and the filling is ready. Meanwhile I started working on the dough. I decided to go with a sweet tart dough with ground almonds. I followed the recipe to the tee....except I snuck in some vanilla extract for some extra flavor. The dough consists of powdered sugar, flour, salt, butter and an egg yolk and comes together in a food processor. I was careful not to over process and not overwork. I separated the dough into 2 disks and refrigerated it for about an hour. Dorie says she always presses her dough into the tart pan. But I decided to roll it out instead since the pressing method didn't yield good results for me last time. Dorie warns that rolling tart dough can be tricky because of the powdered sugar content in the dough, making it sticky. I sprinkled a little powdered sugar on each side of the dough and then rolled it between 2 pieces of parchment paper. I worked fast and, though the dough was delicate, I was able to gingerly lay it into the tart pans. The mini tarts baked in the oven for 20 minutes to a nice golden brown. Check out my tender, shortbread-like crust. Take two on the crust was a success! Even though the filling was a little finicky, it had a nice creamy texture and just the right amount of lemon. Topped off with fresh whipped cream, it made for a pretty nice Sunday afternoon dessert. There are more tarts in The Ginger Snap Girl's future. 2 sticks plus 5 T butter (10 ½ ounces) unsalted butter, cut into tablespoon size pieces, at room temperature. 1 9-inch tart shell made with sweet tart dough (see below). Have a instant-read thermometer, a strainer and a blender (1st choice) or food processor at hand. Bring a few inches of water to a simmer in a saucepan. Put the sugar and zest in a large heatproof bowl that can be set over the pan of simmering water. Off the heat, rub the sugar and zest together between your fingers until the sugar is moist, grainy, and very aromatic. Whisk in the eggs, followed by the lemon juice. Set the bowl over the pan and start stirring with the whisk as soon as the mixture fees tepid to the touch. Cook the lemon cream until it reaches 180 degrees F. As you whisk- you whisk constantly to keep the eggs from scrambling- you’ll see that the cream will start out light and foamy, then the bubbles will get bigger, and then, as it gets closer to 180F, it will start to thicken and the whisk will leave tracks. Heads up at this point- the tracks mean the cream is almost ready. Don’t stop whisking or checking the temperature, and have patience- depending on how much heat you’re giving the cream, getting to temp may take as long as 10 minutes. As soon as it reaches 180F, remove the cream from the heat and strain it into the container of the lender (or food processor); discard the zest. Let the cream stand, stirring occasionally, until it cools to 140 degrees F, about 10 minutes. Turn the blender to high (or turn on the processor) and, with the machine going, add the butter about 5 pieces at a time. Scrape down the sides of the container as needed as you incorporate the butter. Once the butter is in, keep the machine going- to get the perfect light, airy texture of lemon-cream dreams, you must continue to bend the cream for another 3 minutes. If your machine protests, and gets a bit too hot, work in 1-minute intervals, giving the machine a little rest between beats. 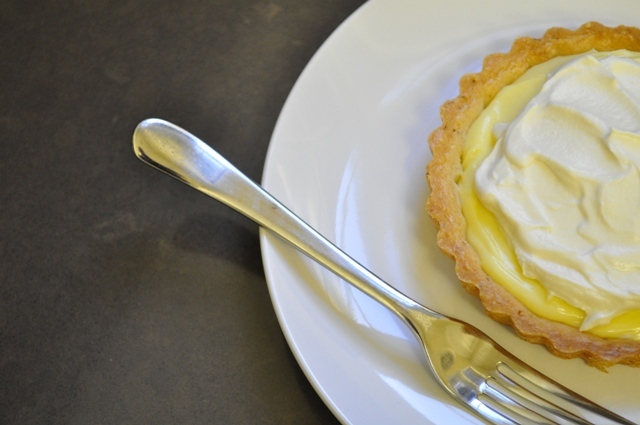 When you are ready to assemble the tart, just whisk the cream to loosen it and spoon it into the tart shell. Serve the tart, or refrigerate until needed. Put the flour (and ground nuts), sugar, and salt in a food processor and pulse a couple of times to combine. Scatter the pieces of butter over the dry ingredients and pulse until the butter is coarsely cut in- you should have some pieces the size of oatmeal fakes and others the size of peas. Stir the yolk, just to break it up, and add it a little at a time, pulsing after each addition. When the egg is in, process in long pulses- about 10 seconds each- until the dough, which will look granular soon after the egg is added, forms clumps and curds. Just before you reach this stage, the sound of the machine working the dough will change-heads up. Turn the dough out onto a work surface and, very lightly and sparingly, knead the dough just to incorporate and dry ingredients that might have escaped mixing. So yummmyyyy.... I just cant wait to make it and gone through it. Gonna make it tonight. Keep posting recipes like this. I will definitely go through your blog every time. Your tarts look fancy bakery delicious! The crust looks perfect and the lemon filling silky and smooth. Lovely photos, too. The Ginger Snap Girl Turns 1!